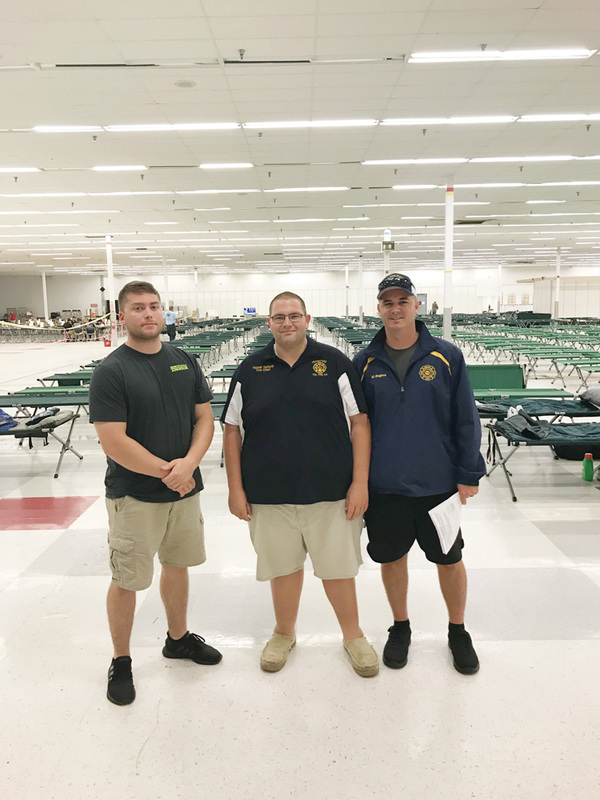 Frankford Volunteer Fire Company member Brian Bacon, Chief Hunter Holland and member Mike Rogers recently returned from nearly a week in Fayetville, N.C., where they helped local fire companies and emergency responders in recovery efforts after Hurricane Florence. Firefighters from Sussex County are back in the area after aiding fellow firefighters in hurricane-ravaged North Carolina. They’ve brought with them memories of new friends and some things to think about, in terms of how a similar storm would affect their own home area. Frankford Volunteer Fire Company Chief Hunter Holland said he and Frankford firefighters Brian Bacon and Mike Rogers arrived home at 3:30 a.m. on Thursday, Sept. 20, having spent about five days in the Fayetteville, N.C., area. Holland said his group was stationed at the Vander Fire Company in Fayetteville, where they helped with a water rescue and assisted local sheriffs with removal of downed trees “so they could get in and check on people.” He said they also helped move food and cases of water that was brought in for distribution. This week, representatives of local fire companies who heeded the call for help from North Carolina officials met with Delaware state officials from the Office of Public Safety and the Delaware Emergency Management Agency for a “debriefing” on their experiences in hurricane relief efforts in North Carolina. Holland said one of the things at the forefront of his mind after the experience was that North Carolina is better-equipped to handle post-hurricane relief efforts in one important way: access to large facilities that can be used as distribution points for food, water and other supplies. “They had access to an old arena, a Sears building, a great big warehouse,” Holland said, where “they could unload stuff from the Red Cross.” He said the large amounts of supplies were unloaded with forklifts. “Where in Sussex County do we have access to someplace like that? You can’t just drive a forklift into Lord Baltimore” elementary school. Another issue that the trip brought into focus for Holland was the concern that, in extreme emergencies, such as a direct hit from a hurricane, many of the local schools — which would likely be set up as shelters and other emergency stations — are in areas likely to experience flooding. Three schools in particular — Frankford, Lord Baltimore and Phillip Showell elementary schools — have ditches nearby and would likely experience flooding in such extreme conditions, even if they haven’t before, Holland said. “My mind is racing with what-ifs,” he said. “It was an eye-opener for me. My main goal was to help people,” he said, and now that he is home, “Now, I just want to help with a plan for Delaware,” Holland said of the trip. On a lighter note, Holland said one of the enjoyable parts of spending time in North Carolina was bonding with fellow firefighters. He said he particularly enjoyed getting to know firefighters he worked with from the Ranger Volunteer Fire Department in the mountains of North Carolina. “We built a really good friendship with them,” he said. “They want us to come up and go bear hunting. We invited them to come to the beach,” Holland said. “I feel like I got lifetime friends,” he added.